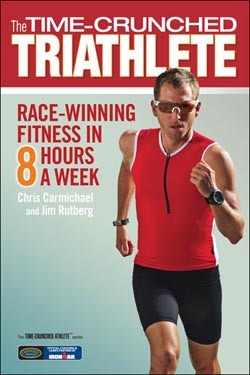 Following the success of his book The Time-Crunched Cyclist, world renowned endurance sports coach Chris Carmichael has published a new book in the Time-Crunched AthleteT series. The Time-Crunched Triathlete: Race-Winning Fitness in 8 Hours a Week will prepare triathletes for faster performances in sprint and Olympic distance triathlons while working within their busy lifestyles. The Time-Crunched Triathlete is now available in bookstores, bike and tri shops, and online. Triathletes are busy people-and not just because they train in three disciplines. Half of all triathletes support growing families-and keep their garages full of tri gear-by working demanding full-time jobs. Yet for these time-crunched triathletes, triathlon is not just something they do on the weekends. Triathlon is a part of who they are. Using The Time-Crunched Triathlete, busy triathletes can train for speed-and even become more competitive-in less time. The Time-Crunched Triathlete leverages the power of high-intensity interval training (HIIT) and tri-specific workouts to make athletes faster at triathlon rather than over-developing their general endurance sports fitness. The Time-Crunched program develops fitness where triathletes need it most, using brick workouts to develop triathlon-specific speed and skills. The Time-Crunched Triathlete's combination of intensity and specificity will enable triathletes to accomplish more with fewer workouts per week. The book offers intermediate and advanced training plans for sprint and Olympic race distances. The sprint plans prepare triathletes for competitive racing in 6 weeks, requiring between 4 and 8 hours per week. Triathletes racing Olympic distances will build speed over 8 weeks, devoting 5-8 hours per week or up to 9 hours for the advanced plan. There is a bonus Time-Crunched half-Ironman training plan to prepare busy triathletes who want to step up to longer races. The Time-Crunched Triathlete provides all the tools triathletes need to build speed quickly. Triathletes will learn the science of HIIT and how three-sport training requires a modified approach to intensity and rest. The book offers a tool kit of carefully designed workouts, including the CTS Cycling/Running and Swimming Field Tests that establish personal training intensity ranges. Carmichael and Rutberg explain how to fuel for HIIT, recovery, and race day. The Time-Crunched Triathlete offers coaching advice on how to schedule workouts into busy days and how to tweak the training plans for individual needs. Finally, the book offers a Time-Crunched strength training plan. Triathlon is more fun when you are fast. The Time-Crunched Triathlete gives busy triathletes a better way to enjoy the tri lifestyle. Chris Carmichael was an Olympian and a professional cyclist before beginning his career as a coach, best-selling author, and entrepreneur. The founder and CEO of Carmichael Training Systems, Chris was recognized as the U.S. Olympic Committee Coach of the Year and inducted into the U.S. Bicycling Hall of Fame. CTS coaches and has coached many elite professional athletes, including Ironman World Champions Peter Reid and Craig Alexander, Ironman St. George Champion Heather Wurtele, Tour de France Champion Lance Armstrong, and NASCAR driver Carl Edwards. For more information, please visit trainright.com. Jim Rutberg is the editorial director and a Pro Coach for Carmichael Training Systems, and co-author, with Chris Carmichael, of The Ultimate Ride, Chris Carmichael's Food for Fitness, Chris Carmichael's Fitness Cookbook, The Carmichael Training Systems Cyclist's Training Diary, 5 Essentials for a Winning Life, The Time-Crunched Cyclist and innumerable web and magazine articles. His work has appeared in Bicycling, Outside, Men's Health, Men's Journal, VeloNews, Inside Triathlon, and more. VeloPress is an endurance sports and fitness publisher focused on cycling, triathlon, and running. For more information on The Time-Crunched AthleteT series and for free chapter downloads, please visit www.velopress.com.